The third-generation Apple Watch, set to launch this fall, will have an "all-new form factor" according to Daring Fireball's John Gruber. Gruber shared the news in a post highlighting Bloomberg's news suggesting the device will include an LTE chip. It's hard to overstate just how big a deal this could be. No mention in Businessweek's report, though, of the all-new form factor that I've heard is coming for this year's new watches. 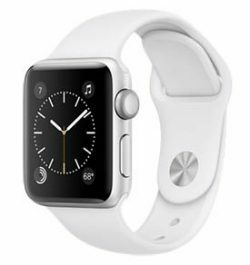 Most rumors about the third-generation Apple Watch have suggested it will be a more minor update that focuses on battery life and other under-the-hood improvements, but ahead of the launch of the Series 2 Apple Watch, KGI Securities analyst Ming-Chi Kuo said the third version would include the device's first redesign. Though we're likely just over a month away from the debut of the third-generation Apple Watch, if it does indeed launch alongside new iPhones, we've heard very little about the device. Aside from rumors of LTE connectivity and a focus on battery, we don't know what else to expect. If there are major design changes in the works, Apple has managed to keep them under wraps, perhaps because of all the focus on the iPhone 8 this year. Update: Gruber updated his post to clarify that his information comes from "a little birdie" and that it might not be accurate: "That tidbit came from an unconfirmed little birdie, though, so I wouldn’t bet the house on it." Give me a round option and I'll finally buy. 1) the watch face to always be displayed. Awkwardly raising my wrist (which only works if I sort of snap it up) or tapping is dumb - this isn't 1976 when we had to deal with LED digital watches. 2) developer access to watch faces. How is it possible that developers still cannot create custom watch faces? If keeping the form factor "big" and not adding LTE is necessary to provide the battery necessary for these two things, I'll happily forgo a new form factor and LTE. No way will they do round. EVery single app would have to be redone and updated. Round would be great. Two sizes like now. At least one of them (the larger) having a more masculine look would be even greater. Really don't care about LTE one way or the other. edit: watch faces. let dev's create watch faces. The Third generation of an Apple product is almost always the one that people wanted in the first place. Yes please! Looking to upgrade my S0 and a re-design would be the perfect excuse. That and because I want swim proof and GPS. I'd like to see Apple create a hybrid automatic mechanical / digital Watch. Let the mechanical system provide whatever charging to the battery it can, which would then also push people to be more active with their Watch to generate the rotating charging function. I'd be far more apt to buy a Watch and put my fantastic 12+ year old Seiko Automatic away or pass it along to one of my boys.